MILK AND HONEY goes back to my series character, number 3 if you’re counting. Decker finds a child wandering loose and alone in the middle of the night. His investigations points him to the discovery of the tot’s murdered parents and some very strange people in a rural bee keeping community. 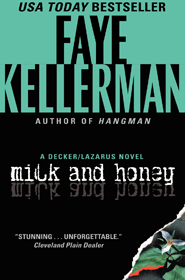 While researching this novel, I learned how beekeepers use smoke to get bees to leave their hives. This information came in very handy when I discovered that bees had set up shop in my fireplace.